Sustainability Division intern Robbie Provenzano pours water into tasting cups. Without knowing which was which, most participants chose campus tap water as their favorite. The Sustainability Division wants to know what members of the campus community prefer in terms of their drinking water by offering a blind sample of water tests around campus this month. Starting last week in Bird Library, the Sustainability Division had more than 70 participants taste three different kinds of water: tap, filtered tap and bottled Aquafina. To many participants’ surprise, the majority liked the tap water the best. For the past few years, the Sustainability Division has held water taste tests to show students, faculty and staff how delicious the tap water here on campus really is. Drinking tap water also reduces the waste plastic water bottles produces. Sustainability Division marketing manager Melissa Cadwell and interns Robbie Provenzano and Shao Mei Zhang set up a table Thursday, Feb. 6, in the entrance of Bird Library with paper cups of the different samples. As participants approached, they were asked to try all three and say which they preferred. The majority preferred tap water, which was taken straight from the faucet in Bird Library. Participants’ second choice was bottled Aquafina, which costs $1.75 on campus. The third choice was the water that came from the water bottle filling station located in Bird Library. Tasters received a free, reusable aluminum water bottle for participating in the test. Similar to Bader, first-year students Abigail Cohen and Sydney Hirsh say they normally drink bottled or filtered water while at SU, because they don’t know how clean or safe the tap water is. Melissa Cadwell says educating the campus on the sustainability of the tap water is one of the main goals of the water taste tests. The majority of tap water available on campus comes from Skaneateles Lake. The water quality of Skaneateles Lake is so high that it is one of the few water supplies in the country approved as an unfiltered water source, according to the City of Syracuse Water Department. Water taken from Skaneateles Lake is tested for bacteria 269 times each month. Cadwell was very pleased with the amount of participation at last Thursday’s water taste test. She said when students approach the table just a few at a time, it allows her and her staff to answer their questions and have a conversation with them about the safety and sustainability behind drinking tap water. “People have been really enthusiastic about it,” says Provenzano. Provenzano is a senior public health major and is working with the Sustainability Division as part of his capstone project. 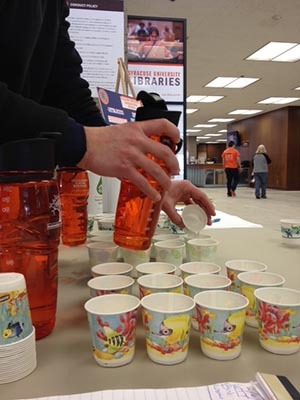 Water taste tests will continue on campus on Wednesday, Feb. 12, in the Whitman School lobby; Thursday, Feb. 20, in the Newhouse food.com area; and Wednesday, Feb. 26, in the Life Sciences atrium. For more information about sustainability at SU, visit the SU Sustainability website, follow @SustainableSU on Twitter and check out the Syracuse University Sustainability Facebook page.